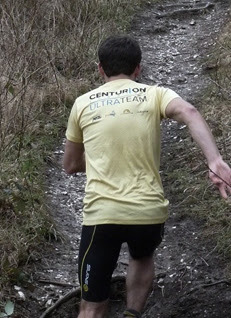 Centurion Running organise a series of ultra-distance events on some of the UK's best national trails. Their first race was held on the North Downs Way in August 2011 and now comprises six 50/100 mile races, a grand slam and the infamous Piece of String Race - The fun run that is billed as "The world's most pointless race". Basically runners don't know the distance of the race. It could be 10k or 100 miles. Or even the route. Only the race directors know. At the start of the race, there are five possible race configurations in envelopes. A runner will pick the envelope and that will be the race. Only two runners finished last year. I know, like me, the more you read into the race, the more you will want to do it? Of course, there's a very serious side to the organisation and James Elson has certainly earned his strips as a top-notch Race Director. The races are full supported and racing and finishing are encouraged in equal measures. Anyone who read my Thames Path 100 report from March, will know that on any other circumstance that race should/would have been cancelled, but James spent the week planning, consulting with experts and re-routing the course, so the show could go on. Centurion Running also provide coaching service, an online store and an Ultra Team. I have recently joined the team as the first (and only!) female to wear the yellow jersey. I was secretly hoping that James would ask, so was delighted when he did. A bit about the team "One of the many great things about our sport is the enormous range of challenges open to each of us. Each member of the team has completely different goals and ambitions, taking different paths to those ultimate aims which sometimes converge at the same or similar events throughout the year. Of course, the over-riding thing about each of these runners is their love of running and that for each of them, it doesn't always require racing to feel fulfilled"
Looking at the list of their previous races, I was a little nervous about penning my running CV. It seemed a little lame and parochial in comparison. I’m delighted to be the first female to join the boy band that is the Centurion Ultramarathon Running Team. Based in Glasgow, I have represented Scotland and Great Britain in 100K and 24 hour races I like road, hills, towpath and trails. Actually, I just like running. Except cross-country. I don’t do cross-country. The longer the better for me, so don’t ask me my 10K time. I’m married to an ultra-runner and fit training around a full-time job and our four-year-old son, Cairn. Juggling is my forte. I also do my own stunts and could fall over fresh air. Skinned knees and bruised limbs is my signature look. I like to do one thing each year that scares me. 2011 was my first 24-hour, 2012 was the GUCR and this year the Lakeland 100. 2014 is still to be decided. Devil o’ the Highland 43 mile race: This was my first ultra-distance race back in 2007 and my comeback race after having my Son in 2009. It’s a firm favourite, not only because it’s special to me, but it takes you magical journey through Glencoe and finishes in Fort William. This views don’t get much better than that. I haverun the race five times and finished on the podium every time. Took me to my 5th attempt to win it though. GUCR 2012: I was the outright winner of the race in 28:01. The first female to ever win the historic event. Although I’m not famed for the performance. I’m known as the numpty who fell in the canal in the middle of the night. Remember what I said about stunts? I also managed to ruin an iPhone, iPod and Garmin en route. IAU World 24 Hour Race: I have represented Great Britain at the event in 2012 (Katowice, Poland) and 2013 (Steenbergen. Holland). I was a counter in the medal-winning team both times, set a new Scottish 100mile record of 15:48 within the race and personal best of 220km for 24 hours. West Highland Way Race: The trail starts close to home and is the playground for many training runs. I have run the race three times 2008, 2010 and 2011 with my best time being 19:38. Lakeland 100 2013: Imagine taking nearly 2.5 hours off the previous women’s record, and still coming in second. Well, that’s what happened to me. Still, I was happy to finish faster than my goal time. And with a full set of teeth. Commonwealth ultra-distance championships North Wales 2011 –representing Scotland in the 24 hour race. Grand Union Canal: 1st overall. Female record holder. IAU World 24 hour championships 2013 Steenbergen, Holland. PB of 220km. Team European bronze. Very impressive CV and I'm honoured to count you as a friend! Interested to what you have planned for 2014! Do you fancy the Hardmoors Grand Slam?? I won't be so silly as to challenge you again. I learnt my lesson in 2010!! Woop! A brilliant new female contingent for Centurion - excellent stuff lady.